Forty-five years ago today, the inmates of New York’s Attica prison initiated the largest revolt of prisoners this nation had ever seen. In a fury of rage at their inhuman conditions they rebelled, beating the Correction Officer William Quinn in to death in taking control of the prison. However, shortly thereafter in a remarkable turnaround they developed a rational decision-making organization which did not seek their release but instead demanded decent conditions for their incarceration. James Forman Jr. (Yale Law School professor) in the September 4, 2016 edition of the NYT Book Review summarizes Univ of Michigan History Professor Heather Ann Thompson’s book Blood In The Water – The Attica Prison Uprising of 1971 and Its Legacy. The Attica “riots” are now only a vague memory to even those in the progressive movement. It is critical that we not forget what public policies eventually lead to the death of 39 prisoners and correction officers, apparently killed by New York’s untrained and unsupervised state troopers and national guardsmen in retaking the prison. In the months preceding the uprising, the prisoners with the help of outside advocates lobbied for better living conditions with no avail. 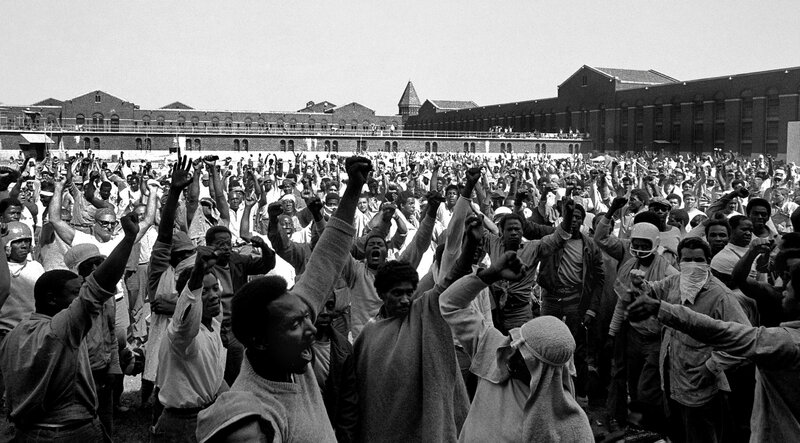 Then on September 9th, 1971 a group of prisoners overpowered a correction officer and all hell broke loose. After a few hours of bloody chaos, the prisoners organized a 4 day sustain effort to negotiate a series of demands from the state. Liberal Republican Gov. Nelson Rockefeller refused to personally participate in the negotiations and called them off on the 13th ordering the prison to be retaken by force. Thompson describes sadistic crimes that took place after the state officials had full control of the prison. To date, the New York state has refused to release thousands of boxes of crucial records. Are we repeating these conditions today? It is important to remember what caused Attica, because many prisons today once again rely more on punishment than on rehabilitation practices. This is ever more true in public prisons operated by private companies. Journalist Shane Bauer’s Mother Jones article “My Four Months as a Private Prison Guard” (August 2016 edition) ignited national outrage at the conditions in privately operated prisons. The federal government recently announced that they would no longer follow this practice. However over 86 percent of prisoners are in state prisons and each state will have to make that decision. While efforts should be made to get the Department of Justice to conduct a massive review of state prisons operated by private companies that effort may well be slowed down by governors and state legislatures who would see it as interfering with state rights. Rather than organize fifty different campaigns to influence each state government, it would be more effective and capture more media attention to focus on one non-federal entity: the National Governors Association. True there are more Republican Governors than Democrats. But Terry” McAuliffe, the Democratic Governor of Virginia, is the chair of the NGA. And he has a record of being supportive of restoring voting rights to ex-felons. In April of 2016, McAuliffe signed an executive order restoring voting rights to more than 200,000 ex-felons in Virginia., unfortunately it was overturned by the Virginia Supreme Court. Just as importantly another Democrat, Vermont Governor Peter Shumlin, chairs NGA’s Health and Human Services Committee. A strategy can be applied to the NGA that works in any legislative-type body in an open democratically run organization: you do not need a majority to bring an item forward for discussion. What you need is a few dedicated members willing to demand that an issue be brought before the body for discussion and investigation. The goal is to begin a process that allows those concerned to raise the issue publically and force the other members to address it publically. The goal is to highlight the issue and require the organization’s members to take a public stand after momentum has built up within and outside the organization. The mechanics of the decision-making process will vary with each entity, but every democratic organization has an opening for the minority to express its opinion and even effect the final outcome. In this manner, only a handful of state-based organizations are needed to pressure their respective governor to bring forward this issue in the NGA, and particularly to lobby McAuliffe and Shumlin to hold a public workshop on this issue and to follow up by requesting that NGA contract with a neutral third party, preferably based at a university, to conduct a national review resulting in an evaluation of the prisoner conditions of privately run state prisons and the public cost the state incurs because of those conditions. That report then becomes a powerful key to opening the door for prison reform. It is not the end however; organizations will need to mobilize public opinion to convince state legislatures to use that key. If they do not, then make it a pivotal issue during their re-election campaign. The conditions that led to the Attica upraising should never be tolerated again within any of our prisons. Focusing on eliminating privately run public prisons provides the best opportunity to get a victory and address the larger issue of improving prison conditions for all inmates. There is a way to win on this issue, but it will take thoughtful organizing.